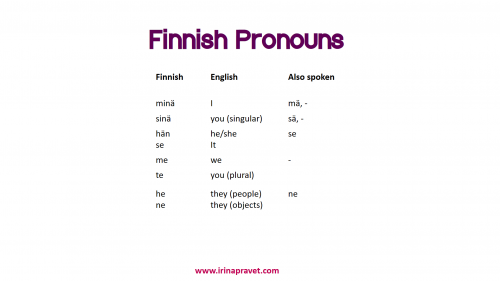 I often get asked about which Finnish vocabulary is really important to learn, and Finnish pronouns are about as important as they get. How come? Because we use pronouns everywhere in every language! In plain-speak, pronouns are words like ‘I, you, he, she, it, we, they’ aka. 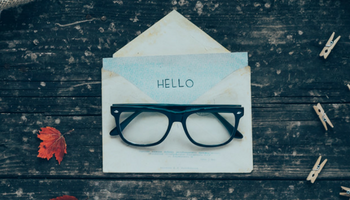 words that often come before a verb, and that help us avoid having to say people’s names or the same word over and over again. Even if you don’t realize it, you use pronouns in every language you speak all day long! Yay for pronouns! They help us be more concise and sound less robotic. and a few tips for how to remember these pronouns. Stay tuned for the next video of this kind on Finnish verb endings!